I will still spend a solid few weeks having a treat or two from the extensive amount of Christmas baking I do in December. People just didn't eat their fair share when they came to visit. I basically make enough so that every person that visits my house needs to eat approximately 15 servings in order to make a dent in it. I should have been posting recipes as I made different treats, but things just get busy. Or I get baking and don't take any pictures. Although late, here is one of my all time favorite Christmas recipes. Fudge! My absolute favorite treat to swipe from a tray of goodies. This recipe is foolproof and just plain delicious. You don't even need a candy thermometer, it is just that forgiving! Bring the evaporated milk, sugar and salt to a boil in a medium sized pot, and cook for 5 minutes. Make sure to stir constantly or it will scorch! Let cool slightly (until very warm, but not hot), and stir in marshmallows and chocolate chips. If they don't melt thoroughly, very gradually heat the mixture while stirring until smooth. Immediately spread into a parchment lined 7x7 pan. This is an odd size, so if you don't have this, you can use a larger one. 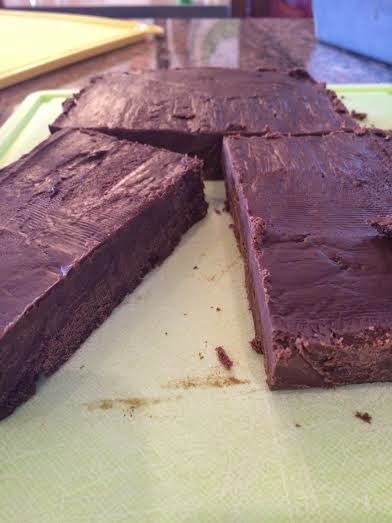 The fudge just won't be as tall because it will be a thinner layer. Working fast with this fudge is the key -otherwise you won't be able to spread the mixture into the pan. If this happens, use a hot knife to spread by warming a butter knife in a glass of hot water.